A TIGHT calf prematurely ended Jordan Lewis' first hitout of 2018 but the Melbourne veteran is expected to be fine for round one. After collecting six touches in the first quarter against North Melbourne in Hobart, Lewis pulled up tight and the Demons' medical staff took no risks. Coach Simon Goodwin said the niggle should not affect Lewis' ability to line up against Geelong in round one on March 25. "He was just a little bit tight in his calf so obviously we're still a month away from round one and we didn't want to take a risk," Goodwin said after the game. "It was more precautionary to get him off the ground and we've got a long preparation in so I'm sure he'll get there for round one." Lewis, who was elevated to the vice-captaincy for this season, turns 32 in April and the Demons will be careful with the management of his injury. While Lewis' experience was missing against the Roos, Melbourne's youngsters stepped up to lead the team to a comprehensive 53-point win. 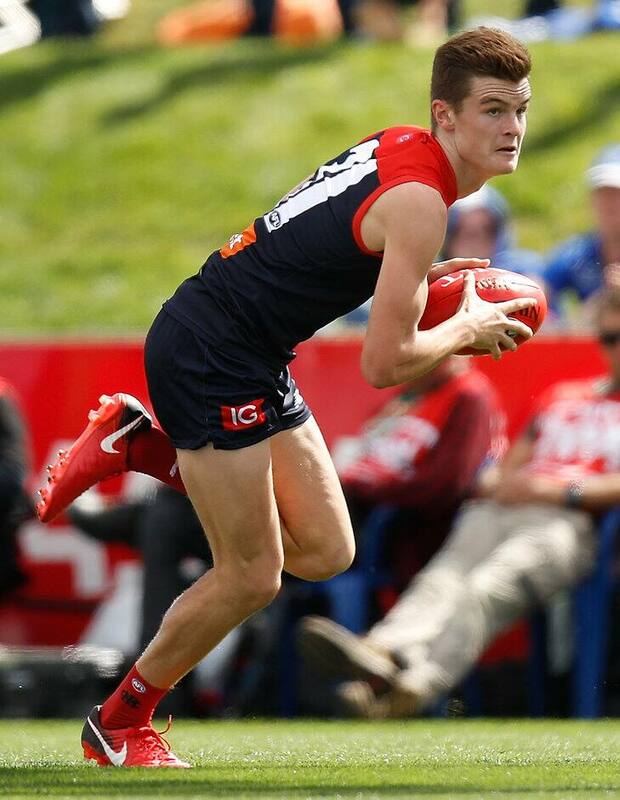 One of those – Bayley Fritsch – put his hand up for a round one debut with a standout three-goal performance, showing his ability in the air and at ground level. The 21-year-old booted 42 goals in 19 games for Melbourne's VFL affiliate Casey Demons last year and the Demons are bullish about what he might be able to produce in 2018. "He's certainly putting his hand up (for a round one debut)," Goodwin said. "He's a pretty talented kid. We watched him closely at Casey last year. He's fitted in really strongly to our playing group. He's given himself the best opportunity to continue to play the way that we want him to and round one might be an opportunity for him." Melbourne booted seven goals to North Melbourne's one in a definitive third-quarter burst, with the Demons showing their full repertoire up forward and through the midfield. "We've been working on that as a group to build depth within our footy club and I thought it was a great even contribution as a team," Goodwin said. "We were strong around the footy, we moved the ball efficiently and we defended quite strongly." The Kangaroos were missing a number of experienced players from their line-up, with important defender Jamie Macmillan a late withdrawal due to illness. Despite the result, assistant coach Leigh Tudor said it was a great opportunity for the club's young players to show what they could do. Midfielder Luke Davies-Uniacke impressed, while key talls Ben McKay, Nick Larkey and Sam Durdin all had the opportunity to play extended game time. "The whole theme of the day was to give opportunity to players and that's what we did," Tudor said. "Young defensive and attacking key position players it takes them years to learn the game plan, learn to get strong… a few of those guys get their chance today so they'll learn from that." Ex-Hawk Billy Hartung also impressed in his first official outing for his new club and was among the Roos' best players. "Billy was really good, especially in the first half. He showed the reasons why we wanted him at the club – he's a good runner, he's a good ball user and he really had a crack for us today so we were really happy with his first-up performance," Tudor said.